It was an afternoon to forget for the Coasters, who lost 2-1 at Cressing Road to relegated Braintree Town, who started the afternoon bottom of the table. The opening exchanges gave an indication of what to expect, as The Iron came flying out of the traps, causing problems with their direct style of play. Already condemned to relegation, they played with a sense of freedom, with Korey Henry being the focal point of The Iron attack. 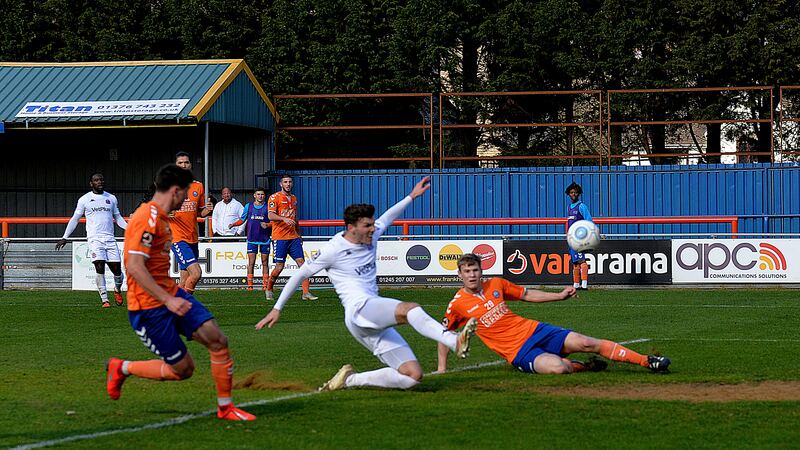 The first chance came for the Coasters, early on, as Haughton’s knockdown teed up Rowe for his first effort, which he connected with well, but Killip held. The driving rain quickly transformed into hail making the conditions tough, but Nick Haughton’s exquisite touch bought him space in midfield, before finding Rowe on the wing. Rowe chopped Eleftheriou inside and out, before firing a low effort goalwards, which again was well held by Killip. Early signs were encouraging for Fylde, as Alex Reid and Danny Rowe combined well, with Rowe slipping Reid in on goal. However, after rounding the keeper and sliding it home, the offside flag was raised on the far side, and the Coasters were denied an opener. Braintree responded well to the warning, and won a free-kick around 25 yards from goal which Mo Sagaf lined up to take. Sagaf’s strike was clean, curling around the wall and nestling out of reach of Jay Lynch, into the bottom right-hand corner, and giving Braintree a first-half lead. The Coasters almost responded immediately, as Danny Rowe tried a spectacular free-kick of his own. It was sent curling goalwards from nearly 30 yards, rising and dipping as if by command, only for the fingertips of Killip to deny him at the final moment. 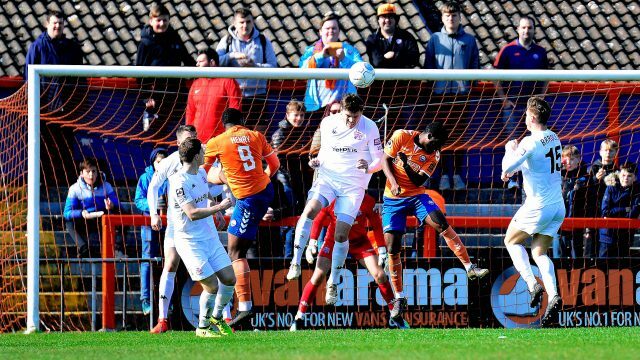 Fylde’s best chance of going in level at half-time came as Haughton found himself in space and unleashed a long-range effort, and this time Killip looked less assured – fumbling it behind. Braintree Town continued in good form, with Korey Henry again at the heart of it all, forcing the backline into awkward clearances. This prompted Dave Challinor into his first change, as Alex Reid was replaced by James Hardy, who had only made the bench for the past two games. There was no immediate resolution, and indeed Braintree almost doubled their lead, as a looping header from Atkinson dropped onto the bar, before Korey Henry’s rebounded effort bounced into the floor and over the bar. Dan Bradley saw lots of the ball, and on one run the space in front of him opened up, inviting him to shoot, but his decision to try and play in the overlapping Birch proved to be the wrong one, and the opportunity was missed. Birch was then replaced by Serhat Tasdemir, as the Coasters looked to find their way back into a match they were heavily expected to win. A key moment shortly followed, as Nick Haughton appeared to be tripped in the box right under the referee’s nose. Both sides waited for the official’s decision, which went against the Fylde forward – receiving a booking for simulation in the process. To make matters worse for the Coasters, the next passage of play saw The Iron awarded a penalty – as Jordan Tunnicliffe was judged to have bought down Henry. It seemed a soft decision based on the slow nature of the chance, but the linesman raised his flag to indicate a foul, and the referee was of the same opinion. The penalty was taken by that man Henry – however, his tame effort was well met by Jay Lynch, parrying it away, only for Courtney Richardson to anticipate this brilliantly, and slam home the rebound. Now 2-0 down, the Coasters had it all to do – with Walters replacing Philliskirk to add further attacking threat to the side. Finally, Fylde did find the breakthrough, as Danny Rowe’s fantastic cross from the left wing was volleyed home by Jordan Tunnicliffe from close range, but it was too little too late. A Danny Rowe free-kick in injury time offered the Coasters a final chance of restoring parity, but the effort was eventually held by Killip, after briefly fumbling it. “It’s disappointing, it makes me angry, and its an opportunity missed -but it’s important we move on,” said Manager Dave Challinor. Braintree Town: Killip, Eleftheriou, Lyons-Foster, Atkinson, Borg, Richards, Karic, Eyoma (Allen 74′), Sogaf, Matsuzaka, Henry.